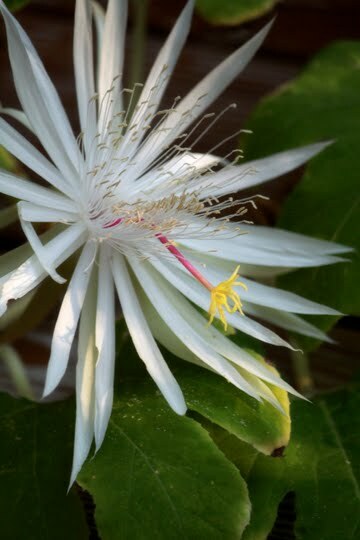 This magnificent flower is the end result of this. I wanted to title this post "From Nubs to ...." but I couldn't find a word that started with N and was synonymous with magnificent or glorious or majestic. 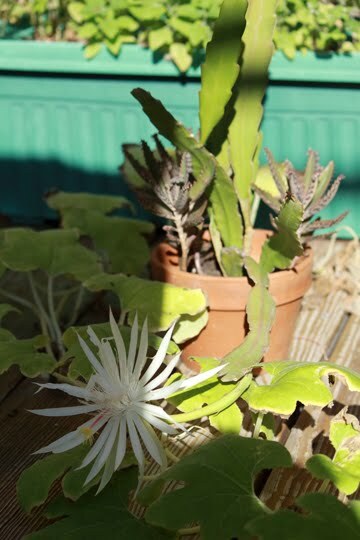 This is a variation of a Night Blooming Cereus. It bloomed last year, when I was out of town. And it blooms at night so if you're not aware you'll miss the whole show. By afternoon it's curled up and done. I knew that it was going to bloom very soon but of course forgot about it Friday night. 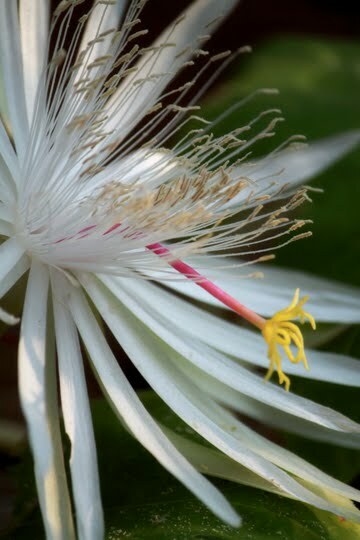 Saturday morning at like 6:30 I woke up and remembered ... the Cereus! Luckily the sun was just starting to rise so the flower was good to go. I grabbed my camera and hoped for the best since I didn't have my contacts in or glasses on! Thank goodness for the red focus dots on the camera! The above image is the interim between the nubs and the bloom, about 2 weeks ago. You can see one of the nubs that didn't make it. The plant probably had 9 or 10 nubs on it this summer and now I can see why all but two of them (there's one going now) didn't make it. There's just no way the plant could sustain that many blooms. The bud had pulled the whole piece of the plant down to the floor of the deck. If 9 of those had bloomed the plant probably would not have made it. 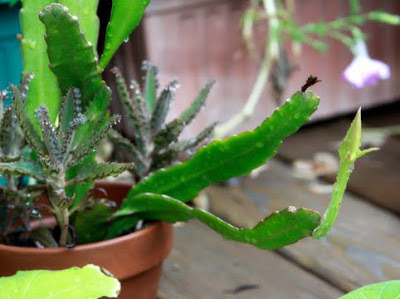 The image below shows the bloom with the whole plant. Next year, this plant needs to be repotted, so it can grow and sustain more of these beautiful flowers. But for now I will be satisfied with the one morning of magnificence.